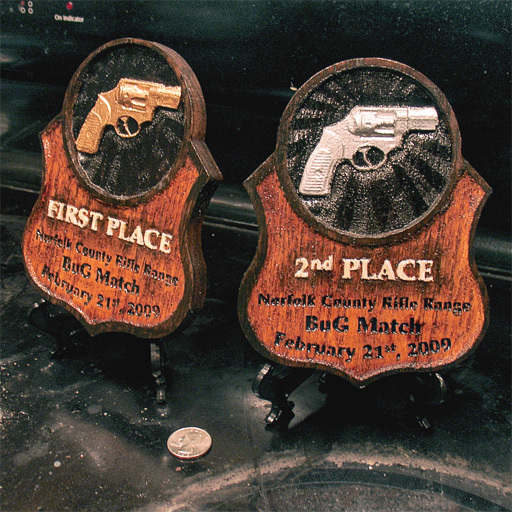 Made for a Back-up-Gun Competition (hence "BuG") held at the Norfolk County Rifle Range, these two plaques are the first trophies Kelli and I have made. They're smaller than they ought to be, since the Carvewright doesn't handle really small text especially well, but I was pleased with the pistol sculpt. Future opportunities like this will be more successful, I reckon. Kelli's paint/finish job pulls a lotta great detail that's not present in the raw versions.